"Elizabeth Thomas, b. Unkn. d. 1 May 1866 Elizabeth was the wife of Edward Thomas. She died at the age of 89 years, 1 month and 2 days." In the U.S. Census Marion County, IN 1820, there are no households headed by a person with the surname "Thomas." Wayne Township-Elizabeth Thomas, William Thomas." 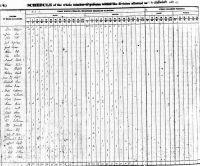 In the U.S. Census Marion County, IN 1840, there are seven households in four townships headed by a person with the surname "Thomas:"
Lawrence Township-John Thomas, William [S.] Thomas"
In the U.S. Census Marion County, IN 1850, there are five households in four townships headed by a person with the surname "Thomas" AND BORN IN KENTUCKY. Lawrence Township: "William [S.] Thomas, age 45 b. Abt. 1805," [thus very likely the same "William" enumerated in 1840, as well as 1860, 1870 in this township, son of Edward Thomas & Elizabeth Shaw, hence brother of Thomas N. Thomas; husband of Mary Hensley]. Perry Township: "Thomas N. Thomas, age 38 b. Abt. 1812," [very likely the same "Thomas N." enumerated in 1840, as well as 1860, 1870 in this township, son of Edward Thomas & Elizabeth Shaw, hence brother of William S. Thomas; husband of Eliza Mcfarland]. Perry Township: "Edward Thomas, age 35 b. Abt. 1815," [very likely the same "Edward" enumerated in 1840, as well as 1860, 1870 in this township, husband of Catherine Moore]. Indianapolis: "Caleb [Louis] Thomas, age 29 b. Abt. 1821; John [Mitchelltree] Thomas age 21 b. Abt. 1829;" [sons of John Thomas & Elizabeth Goff]. Elizabeth Shaw (I13575) was the mother of Edward Charles Thomas (I13576) and was the sister of the husband of Ann Porter Harbison (I22976), whose parents were James Harbison and Rachel Porter (I22980 ). Rachel Porter was remembered/honored in the middle names of several generations, who resided in Nicholas County, KY: Ann Porter Harbison (I22976), Roland Porter Thomas (I43718 ), Patsy Porter Thomas (I43615), and Roland Porter Kenton (I22966). Family Edward Thomas, b. England , d. 18 Mar 1836, Marion County, Indiana, U.S.A.
Died - 4 May 1866 - Marion County, Indiana, U.S.A. Buried - - Lick Creek cemetery, Beech Grove, Marion County, Indiana, U.S.A. 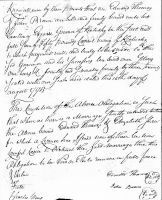 There are seven households in four townships headed by a person with the surname "Thomas:"
Lawrence Township: John Thomas, William [S.] Thomas"
"Mary [Buchanan] Thomas, age 28 b. Abt. 1822 Kentucky, not employed; five children b. Kentucky: William 11, Andrew 9, Washington 8, John 4, Anderson 2." "Elizabeth [Shaw] Thomas, age 73 b. Abt. 1777 Virginia, not employed."